The Euphoria 110 Duo shower set combines style and quality with an affordable price. The shower head has two types of sprays to choose from and is delivered in a complete set, including a 900 mm shower rail, a handy soap tray and a 1750 mm long shower hose for lots of elbow room. The set has many technologically advanced highlights, focused on enhancing your shower fun and convenience. The hand shower is equipped with an extra-long handle which transforms seamlessly into the shower head, thanks to the elegant chrome ring. GROHE DreamSpray distributes the water evenly to all spray nozzles and with the GROHE SprayDimmer you can smoothly adjust the spray. SpeedClean makes sure that limescale stands no chance and Inner WaterGuide provides a longer life. The shower head also has Twist-Free, which allows the shower hose to anticipate on all your moves and therefore is never gets tangled up. 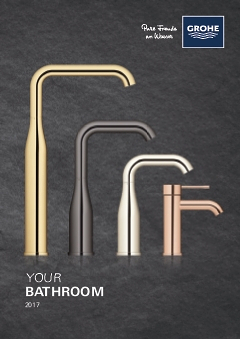 Very useful from GROHE.